When I visit Darren Borgias at his office in Medford, he shows me a colorful poster that illustrates what the ideal dry, southwestern Oregon forest looks like. And historically, he says, this ecosystem was nurtured and maintained by fire. Borgias is with the non-profit Nature Conservancy. He says putting fire back to work on the landscape is a key part of a restorative approach to forestry. 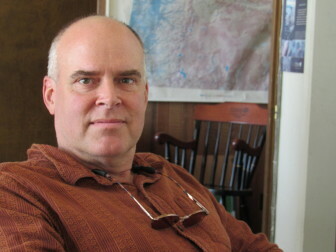 Darren Borgias is SW Oregon Program Director for The Nature Conservancy. The Nature Conservancy is one of several partners in a ten-year program to restore ecological balance to nearly 8-thousand acres of mountain forest next to Ashland, Oregon. By thinning excess growth that historically would have been cleared out by natural forest fires, the project hopes to head off a severe fire that could endanger the town’s water supply, as well as its tourist economy. Borgias says the same principles could be scaled up to apply across larger landscapes – for instance, the Rogue Basin. This idea has gained wide currency, and the US Forest Service has identified tens of millions of acres across the West as needing treatment. But some researchers aren’t sold on this model. Dominick Dellasala is chief scientist at the Ashland-based Geos Institute, a non-profit that deals with climate change. Dellasala agrees that fire is a crucial element in maintaining healthy forests. But, he says, the data don’t support the idea that a buildup of forest fuels is the problem. 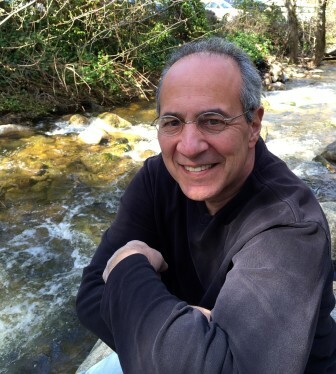 Dominick Dellasala is Chief Scientist at the Geos Institute in Ashland, OR. Dominick Dellasala: “We now have a climate signal that’s driving fire behavior. More and more fires are responding to climate; extreme weather events, drought, high winds, high temperatures. That is going to override any fuel treatments that we do on the ground. Rather than try to reduce fire across the landscape, Dellasala says we should learn to co-exist with it. Dellasala notes that using fire-resistant building materials and clearing trees and brush from around a house improves the odds of it surviving even a severe fire to better than 90 percent … He says co-existence with fire also means thinking twice about where we build. Wildfires may not be at historic high levels, but the cost of fighting them certainly is. For the first time ever, this year, the Forest Service spent more than half its budget on firefighting. And one main driver of that expense is the need to protect lives and property as development pushes further into the woods. Liam Moriarty is a veteran public radio journalist.